Valve chooses the eight teams worthy of a direct invite. The dust in the Dota 2 scene has settled, and eight squads have been chosen to battle for millions in the Kiev Major. Hailing from three international regions, they have been directly invited to the LAN finals of Valve’s event in Ukraine in late April, each eyeing a slice of a multi-million dollar prize pool. While eight teams have yet to be brought into the ring from their own regional qualifiers, those guaranteed a spot are already among the top of the world. * Ad Finem have subsequently let their Dota 2 team go, but the invite stays with the players who are expected to announce a new team soon. The first invite went to The International 6’s defending champion Wings Gaming, which had a versatile and fiery showing at the annual event back in August. While their performance hasn’t been outstanding since their 5th-8th place finish in Boston, they’ve held onto their roster and held their own against many other teams across the globe. At the very least, it seems that at least the stable TI6 roster and regular appearances kept the team worthy of consideration. Wings can always rise again, though they may have to fight through other regionally-strong teams—and further, those at Kiev—to reach their peak potential. Boston Major champs OG had the opposite issue (if one can call it that) in the past year. 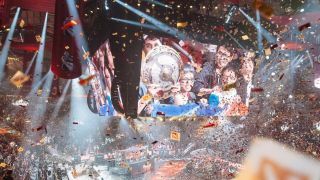 While they fell in an unexpectedly-difficult match at TI6, the squad worked back to full strength through a new lineup and won December’s Major. The European squad returns for a fourth potential Major win after maintaining an impressive regional showing, led by a strong captain who thoroughly understands his teammates’ strengths and has adapted to the changing tides of several patches. They now need to overcome the resurging momentum that other teams have picked up since Boston. Of course, any team can have tricks up their sleeve, and OG is no exception. As the Greek 'underdog' team, the squad formerly known as Ad Finem’s main showing was in the Boston Major itself through their inspiring second-place run. The team brought high energy and mind-blowing individual performances to the stage that garnered a quick, passionate following and brought hope to the Greek scene. However, their focus on Boston seems to have let everything else fall to the wayside: that, or their lack of presence in tier-one matches forms a vicious cycle. Still, Valve rewards stability in regard to their own events, and with this in mind not inviting Non Finem would work against the developers’ own ethos. Now that they’ve been invited, the community will be kept asking: will they step it back up for Kiev? The third and last European invite, Team Liquid, was once dubbed the rivals of reigning regional champions OG, and now they’ve proven yet again to be a formidable foe with cohesive and memorable performances. They took the sole European qualifying spot for the Dota Asian Championships, and they ran from the qualifiers of last month’s StarLadder tournament to take the grand prize. Team Liquid hasn’t showed up this well since the lead-up to last year’s spring Manila Major, where they came second, only falling to OG. Now, their new post-Boston lineup looks to repeat last spring’s run, but hopefully with the optimal outcome this time. North American teams also brought their A-game to the Boston Major, and they’ve kept it up since then. Even immediately after 7.00 dropped, Evil Geniuses maintained their pace by winning the China Top cup the following weekend. They’ve been dominant in their few professional experiences since then (minus the offbeat Elimination Mode tournament), and regionally, they’ve been unshakable as the top North American team in the game, as they have been since their TI5 win. It’s just a matter of how they will emerge of their training, then, into both DAC and Kiev. If their recent history alone could talk, it’d say that their opponents need to stay on their toes. Speaking of opponents, much of the same could be said for Digital Chaos, which took second at TI6 and fell to Wings. Since then, the team has shuffled, but they’ve kept presence in both the regional and international scenes. After their surprising loss to Ad Finem during the Greek team’s hot streak at Boston, they’ve gone on to win ESL One Genting and qualify for DAC, maintaining the versatility that made the TI6 squad successful. Their wins overall haven’t been as persuasive as regional counterparts EG, but they certainly aren’t a force to be reckoned with and are a competing regional name against the TI5 winners. The region recognizes their power as well, as they were directly invited to DAC where they’ll show their chops before Kiev. On the other side of the world, despite complaints about the presence of five Chinese teams at Kiev, nobody can say the remaining two invited teams haven’t worked for their spots. In a trying time for the region, Newbee, playing under the TI4 champions’ banner, have performed well, taking second at ESL and winning the Dota 2 Professional League. The team has kept their place at the top of the region with a uniquely safe but proven approach to their lineups, playing to their team’s strengths. The region recognizes their power as well, as they were directly invited to DAC where they’ll show their chops before Kiev. Last but absolutely not least is Vici Gaming J, where the “J” represents the official endorsement by Chinese-American basketball pro Jeremy Lin. If he had any say in putting the squad together, it shows that he’s absolutely in the loop for the Chinese scene, with a mix of proven players and rising stars. While their individual picks are somewhat predictable, their strength individually and as a team have been more than enough to push them to the top. The formula clearly works well, as they were one of four teams Chinese qualifier teams that made it through a tough pool for DAC, and they qualified for and nearly won the StarLadder event, defeating OG and only falling to Team Liquid. In Kiev, VG.J may be looking to establish themselves more formally on an international scale as a dominant Chinese force. With a month and a half between now and Kiev, eight teams yet to qualify, and plenty of matches and tournaments until then, it’s hard to say who of the above may come out at the top if any. The Majors have already been a source of pride and surprise, even in the short time since their inception. Of course, with teams like these already leading the pack and an already-vibrant new meta from 7.00 to 7.02, we can be confident that it’s going to be the Dota event to watch.